On May 5, 1867, Otto Baur stepped off a stagecoach and into the frontier settlement of Denver. Having traveled for over a month from Pennsylvania, through dangerous territories and by way of nauseatingly bumpy trails, Otto Baur was never happier to plant roots in his new home. After getting a job at the local Bakery, Otto started saving up his monthly salary of $40. In the Fall of 1870 Otto decided to go into business for himself, joining forces with James Colwell, a bookkeeper who furnished the capital. 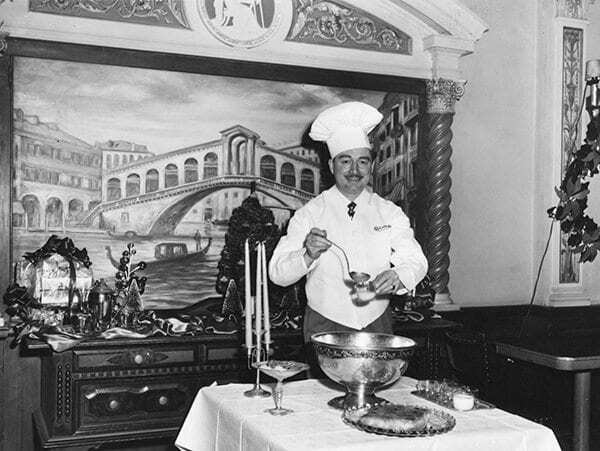 This venture proved prosperous as Otto kept busy serving dinners and parties to many of Denver’s hostesses. One of Otto’s first famous concoctions was the ice cream soda, invented in 1871. This came about when a customer asked for his regular morning cream charged with seltzer. Lacking regular cream, he used ice cream. The change was such a success that soon many people were flocking to Baur’s to have ice cream flavored with fruit juices. Finally in 1874, Otto Baur attained the realization of a dream. He purchased the long established Schueler Confectionary Store and bought out his partner, Colwell, thus becoming the sole owner of his own business. Two years later Otto marries Marie Tuner, Daugher of the founder of the Kuner-Empson Pickle Company. In 1878, Baur secured the services of a young Kentuckian, Theodore L Meier, who had been employed by leading confectioners in the east. With such an able assistant to leave in charge, he and Mrs. Baur’s were able to make many trips East and to Europe, studying the latest trends and improvements in confectionery. In 1891 the Baur Company moved to its present location at 1512 Curtis Street, shortly after Meier had been made an officer of the firm. In the years that followed, the name Baur’s became famous throughout the country for delicious, original confections. Baur’s nephew, John Joseph Jacobs joined the firm and began learning the business from the ground up. Baur continued to make many trips, including on to Mexico City, where he gained information on the Aztec use of cocoa – information which was incorporated in the recipes of the delicious candies that we know today. In 1904 Otto Baur took his last trip overseas to Europe and returned to his deathbed. Theodore Meier took over the presidency and Joe Jacobs, Mr. Baur’s nephew, became secretary and treasurer. 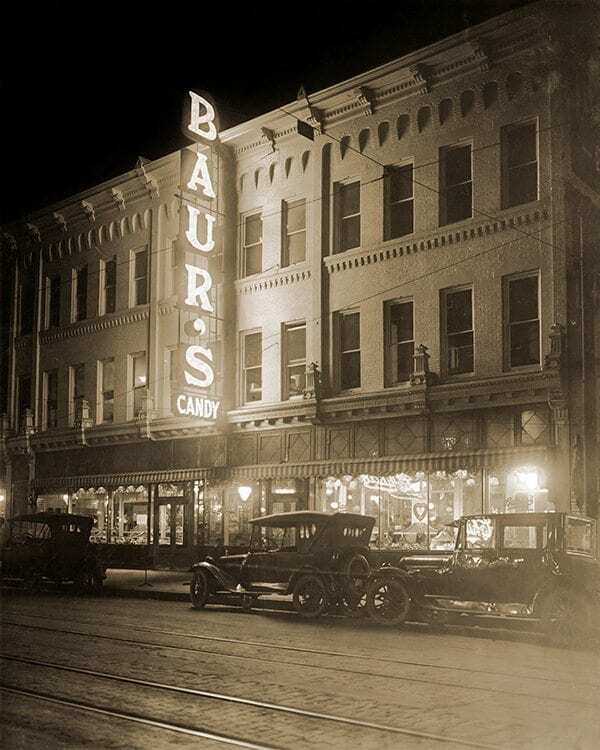 In the 1890’s Baur’s employed 20 people and by 1918 business had increased to where 125 employees were on the payroll, and many of the fine products were nationally known – such items as French mints, Crystal Cuts and Mija which derived its name from the first syllable in the names Meier and Jacobs. Between 1924 and 1940 the company’s presidency changed hands a few times finally leaving a young 28 year-old John H. Jacob, a great-nephew of Otto Baur, as acting president. John’s inexperience in business was questioned on the heals of Meier’s retirement and John J. Jacobs’ death, but he pressed ahead. He modernized Baur’s equipment, management strategies, and inside communications. However, war rationings and wage freezes coupled with John’s rapid expansions led Baur’s into increasing debt. In 1951 the investment firm Peters, Writer and Christensen bought Baur’s from Joe Jacobs’ estate as well as the controlling interest from the family stock holders. In 1955 Gerald Peters opened up a new location in Denver’s newly established Cherry Creek District, but the commitment to quality ingredients and excellent service fell short when competing with the growing fast food industry of the 1960’s. Finally, in 1969 the existing six Baur’s restaurants were sold to Aircoa and the Baur’s name ceased operations. Dazzle was first founded in January of 1997. It was the brainchild of Karen Storck and Miles Snyder. After four years of business Donald Rossa, the current owner, was brought in as a partner in 2001. This was the beginning of a new era for Dazzle. Between Donald’s business savvy and Karen and Miles’ love for jazz, a complete vision was able to become a reality and thus a true Jazz Supper Club was born in 2002. Donald went on to buy the restaurant in 2003. Dazzle soon entered a golden era of recognition and quality of standard, winning #1 jazz club in Denver every single year between 2003 – 2018 by Westword Magazine. Dazzle was also distinguished as being a part of the “Top 100 Jazz Clubs in the World” by Downbeat Magazine numerous times. In June of 2017, Dazzle left its tenured home on 9th and Lincoln and moved to its new home, downtown between the Denver Performing Arts Center and the 16th Street Mall, the historic Baur’s Building. Here we are today, pushing the standards of service and live music further and further.